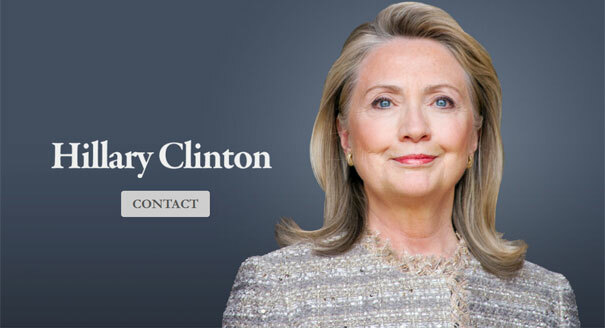 Screen grab from Hillary Clinton’s new web site. There were two great national social movements of the 20th century, Civil Rights and the Women’s Movement. (Also known as the Feminist Movement, Women’s Liberation and Women’s Lib.) As these movements gained momentum they contributed to the social upheaval that helped define the decade of the 1960s. Through Barack Obama, one of these two great social movements has reached the pinnacle of power twice. But in next few years, will the Women’s Movement, led by its representative-in-chief Hillary Clinton, make an all out attempt to achieve that same goal? And will the “dominant media” be 1000% behind Clinton as the leader of the movement to help elect the first female President of the United States? For the record I am not, nor have I never been, a Hillary supporter, but as a baby-boomer Republican woman having come of age during the peak of “woman’s liberation,” I can not ignore what I foresee as an extremely ripe political movement on the horizon, even though its leader will not receive my vote. All my political sensibilities point to a majority of American women of all ages, races, education levels and from all parts of this nation banding together to fuel a “Hillary in 2016” super-sized rocket on a trajectory straight to the White House. However, the rocket ship stays on the launch pad if Hillary decides not to run in 2016 due to declining health or other unknown factors. But if launch is a go, than woe to any Republican male whether he is white, Hispanic, plus-sized or lean, who dares to be her opponent in 2016. But my contrary belief is that the movement to elect the first female president of the United States already has tons of industrial strength momentum and its own sense of historic urgency now seen almost daily on display throughout the mainstream media. Whereas, the movement to elect a Latino commander-in-chief will not be nearly as strong in 2016 as it will be say a decade or two from now. For the remainder of 2013 and probably well into 2014, the major theme of all the Hillary coverage will be focused on the question, “Will she run?” But once that is answered in the affirmative, and deals are made to eliminate any Democratic primary opposition, you can expect blatant mainstream media bias on par with what occurred during the 2008 presidential campaign fueling the historic movement that elected the first African-American president. As one prominent Republican campaign strategist told me during the 2008 McCain campaign, it is nearly impossible for any presidential candidate to be victorious if he or she is running against a social movement and Hillary in 2016 will most definitely be a social movement. Ironically in 2008, Hillary was burned when she ran up against an even stronger social movement (at the time) with its goal to nominate the first African-American Democrat candidate. But in 2016 all the stars will be aligned in her favor. This is because for great movements to be successful they must be perfectly timed and fueled by a desire to achieve something once almost unachievable or to compensate for past treatment now considered to be unjust. And the movement of Hillary in 2016 has all of the above. Additionally, successful movements like Obama’s quest for the presidency in 2008 must first have the full faith and backing of the dominant media and once that is achieved, all the “plain folks” usually just fall in line. (See gay marriage and gay rights as the most recent example of such a movement). Furthermore, Hillary Clinton in 2016 will have even more of an advantage than did Senator Obama at the beginning of his movement. Her favorability is already extremely high at 67% and she does not have to be introduced to the American people, as was the case in 2008 with a little known newly minted Senator from Illinois. However, the dominant media, in concert with the growing power of American women will form a tour de force that, in my opinion, no male Republican presidential candidates currently on the 2016 horizon can expect to overcome. It is my sincere hope that the 2016 GOP candidate will find a way to win the White House anyway. But if Hillary is the Democrat nominee she will be more than a presidential candidate. Hillary Rodham Clinton will represent a “triumph” of the women’s movement similar to the “triumph” of the Civil Rights movement which twice helped elect Barack Obama.